2006 marked the 175th Anniversary of James Clerk Maxwell’s birth. Visit the archived Maxwell Year 2006 website for further information about the special events held in his honour. 2015 coincides with the anniversaries of a series of important milestones in the history of the science of light, including the works on optics by Ibn Al-Haytham in 1015, the notion of light as a wave proposed by Fresnel in 1815, the electromagnetic theory of light propagation proposed by Maxwell in 1865, Einstein’s theory of the photoelectric effect in 1905 and embedding light in cosmology through general relativity in 1915, the discovery of cosmic microwave background by Penzias & Wilson and Kao’s achievements concerning the transmission of light in fibres for optical communication, both in 1965. RSE-Royal Society of Edinburgh The foundation offers lectures to primary and secondary schools in parallel with RSE initiative. IEEE/RSE James Clerk Maxwell Award The IEEE/RSE James Clerk Maxwell Award, established in 2006, recognizes groundbreaking contributions that have had an exceptional impact on the development of electronics and electrical engineering, or related fields. Cavendish Laboratory The Cavendish labs kindly lends Clerk Maxwell experimental apparatus for exhibitions arranged by the foundation. Institution of Civil Engineers In view of Clerk Maxwell basic contributions to civil and structural engineering, collaboration takes place with local branches of the Institutions in providing a place for meetings and in providing a Clerk Maxwell lecture. Institute of Physics The Foundation gives presentations to primary and secondary schools in Scotland in collaboration with the Institute of Physics (Scottish branch). The history of Science Group of the Institute hold symposiums from time to time in the birthplace. The Clerk Maxwell Cancer Research Fund In view of Clerk Maxwell's discovery of the Electromagnetic Spectrum and its growing importance in cancer therapy, a research fund has been established on the initiative of the oncologists at the Western Infirmary, Edinburgh, for research into the use of electromagnetic radiation from lasers to gamma rays in the diagnosis palliation and cure of cancer. The following links to external sites are provided as a convenience, and do not imply endorsement by the Foundation. 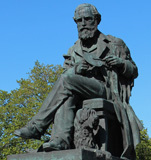 James Clerk Maxwell at Wikepedia "The Free Encyclopedia"